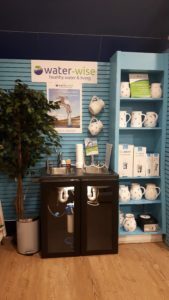 Water-wise is an Irish company based in Co. Galway. The filtration system itself is manufactured in Germany. It’s founder, Fritz Mohn has been living in Ireland since 2008 and formerly worked as a Food Process Engineer overseas. Water is something living that should be respected. It is not just the chemical formula H2O. It is part of an organism that should be full of life and full of energy. As such it gives us the gift of health and vitality. Water-wise filtration removes almost all substances that do not belong in natural water. Additionally, it reactivates your drinking water and enhances its biophysical effect by using a natural process in harmony with nature itself. The treatment is similar to deep bed filtration using concentrated activated vegetable charcoal derived from coconut shells without the need for electricity, chemicals or additives. Filtration removes over 90 % of heavy metals, over 99.9% of bacteria, chemicals, chlorides, pesticides, hormones, medical residues and bad odours.